Proving once and for all that you can't keep a good Slayer down, Joss Whedon's Buffy the Vampire Slayer: Season Eight picks up where the smash hit TV show left off! As Giles, Buffy, and Andrew continue to train neophyte slayers in various locations, teamwork gets encouraged, and Lando Calrissian's fashion sense gets slammed. With Buffy still under a mystical sleeping spell, Ethan Rayne, a chaos-worshiping wannabe sorcerer, visits her dreamspace and helps her to navigate the bizarre terrain. Being held captive, and with her powers being siphoned, Willow is slowly mutilated by the vengeful--and skinless--Warren Mears. One of Buffy's decoy doubles recalls how she was called upon and trained to be a slayer. The heroic young woman's undercover assignment takes her deep underground, where she leads a stand against Yamanh and his demonic horde. Faith is approached by Giles with a dangerous assignment--to pose as a British aristocrat in order to assassinate a wealthy, rogue slayer under the tutelage of an Irish warlock. Posing as a viscount's daughter, Faith infiltrates Lady Genevieve's gala and is attacked by Roden's gargoyle security team. Elsewhere, Willow offers to Dawn with her plus-sized problem and is called upon to upgrade the castle's defense system. As Giles tries hopelessly to contact Faith, Lady Genevieve explains her rationale for wanting to assassinate Buffy. As Faith and Genevieve battle to the death, Buffy confronts Giles about Faith's assignment. After a flight of fantasy, Buffy and Willow enter the demonic lair of Sephrilian, a dangerous realm of unstable reality where the friends' darkest secrets, both past and future, are revealed. While the rest of the girls party, Buffy and Xander discuss the matter of a rogue slayer. Later, Buffy and Satsu discuss affairs of the heart as they take on a nest of vampires. Buffy and Satsu's amorous encounter is rudely interrupted when a gang of transmogrifying Japanese vampires storms the castle and steals Buffy's scythe. Later, Xander seeks the help of an old friend. Realizing that the Japanese vampires have stolen his secrets, Dracula agrees to help Xander stop them. And, as Buffy's crew prepares to go to war, a Japanese slayer named Aiko tracks the vampires, with disastrous results. After a gruesome welcome to Tokyo, Buffy and Willow capture one of the Japanese vampires and learn of a sinister plan to revert all slayers into ordinary humans. 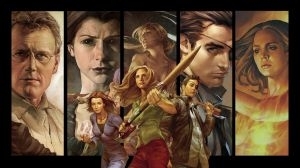 After the shocking death of one of their own, Buffy and her team take on Toro's army of vampires. And, while Dawn slugs it out with her own mechanized doppelganger, Dracula and Willow team up to stop Toro and his diabolical spell. As Buffy and Willow head to New York on a cryptic mission involving Buffy's scythe, Twilight, Warren, and Amy launch a deadly attack on the slayers' castle. Having been transported into the future, Buffy joins forces with Melaka Fray, a fellow-slayer whose twin brother, Harth, is a vampire contemplating an evil plan. While Willow seeks otherworldly help in bringing Buffy back from the future, Xander and Dawn flee deep into the woods, where they encounter a strange race of tree-like forest souls. Xander and Dawn lead an army of wood creatures into battle against Warren and Amy's minions.